Tis the Season to start looking for the perfect gifts to give friends and loved ones. 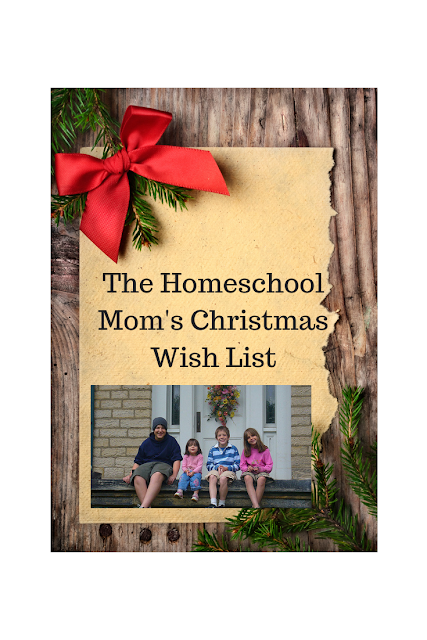 If you are a homeschooling mom who would like to share a wish list with your spouse or the grandparents and godparents, here's a list to get you started. Because when you need them for handwriting, to fill out a form, or even write a check, you never can seem to find them! Crayons for pre-K to 3rd grade or so. Laminator - this has been on my wishlist forever. I use the one at the library now instead for preserving special pages, worksheets and other special projects. Sharpies for art and other projects. ETA hand2mind Multi-Sided, Linking Cubes, Educational Counting Toy (Set of 500) for early math education. Binding machine - for binding my own e-books and the books my kids write. Sewing machine - to teach the kids sewing and to repair and make other projects. Printer - I recommend Brother printers. I have a laser Brother printer and an ink jet. They last a long time and make great copies. Telescope - from pre-K to high school, a telescope is a wonderful learning tool in astronomy class. When kids think up something artistic to do, they need the supplies to do it! Microscopes - for jr. high on up. Kindles - I have tons of ebooks on my kindle as well as audio books for my kids to listen to as part of their literature studies. Camera - to record it all! Some of my favorite affiliates are also having sales this week! Have you always wanted to try Bravewriter! The Writer's Jungle - A must have for the Bravewriter Lifestyle. Also, Notebook Pages is having a special - buy one-lifetime membership and get the second one free. Get one for yourself and one for a friend. I am a Lifetime Member! If you are a little nervous about teaching high school or getting your student accepted to college, this is the resource you want to ask for this Christmas. I blog about Lee Binz all the time and how her guidance helped me get my student into the college of his choice with the transcript I made for him. They also helped me get him NCAA approved for track and cross country. Techie Homeschool Mom is also having a sale! Learn about 10 countries and their Christmas traditions with this engaging eCourse. "Travel” to each country with Google Maps, then read web articles and watch videos to learn more. Create a craft or other hands-on activity then plan and make ethnic Christmas feasts. Use the five brand new music lessons from this mini-course, plus the five bonus lessons, to learn about Christmas carols, Christmas songs, and other Christmas music that is sure to get you and your students in the holiday spirit! This unique Advent eBook is just what you need to prepare your children’s hearts for Christmas! This would be a great gift for a homeschool mom! Pre-pay her admittance to the Teach Them Diligently Convention!